Tony Blair was last night accused of helping to secure a plum job for Alastair Campbell’s firm on a ‘dictator’s payroll’. The claim was made after US Government documents revealed the extent of links between the former Prime Minister and the lobbying company that employs his former spin doctor. According to US Justice Department papers, the authoritarian Kazakhstan regime in central Asia is represented in the US ‘through Windrush Ventures Limited, through Portland PR Limited’. The entry appears to indicate that Mr Blair, whose multi-million- pound earnings are channelled into Windrush, secured the contract in Washington for Portland, a public relations firm for which Mr Campbell acts as an adviser. Mr Blair has always denied receiving money to ‘whitewash’ Kazakhstan’s human rights record, insisting that he has been advising on political reforms to ‘make a difference’ to the country and ‘is not personally making a profit’. 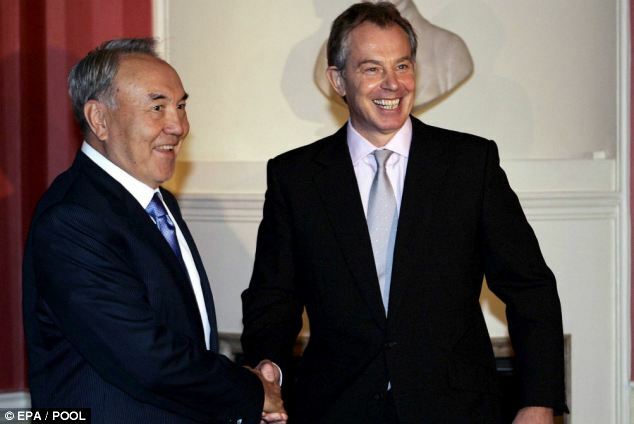 However, the US document appears to confirm suspicions that Mr Blair has used his connection with its ruler, Nursultan Nazarbayev, to broker a lucrative deal for his former aide. Tory MP Charlie Elphicke said: ‘This appears to confirm what we have long suspected: that Blair has been directly involved in securing plum jobs for his cronies.’ The disclosure comes just days after Mr Campbell revealed that he is considering standing for Parliament and that he will advise Labour leader Ed Miliband in the run-up to the 2015 Election. The former Downing Street communications chief has been spotted in the oil-rich state, which has been ruled for more than two decades by Mr Nazarbayev – a Soviet-era hardman whose regime has been criticised for serious human rights abuses. According to the Justice Department document, the Windrush/Portland arrangement was registered with the US Government in September 2011. Sources said that such a deal was likely to be worth millions of pounds a year.